Some bacteria can disarm antibiotics by tying them up. Others can pump them out before they can work. And some can eat them. Now, researchers can explain how these drug-gobbling germs do it. And they say their findings can help fight antibiotic-resistant superbugs in the future. “Ten years ago we stumbled onto the fact that bacteria can eat antibiotics, and everyone was shocked by it,” said Gautam Dantas of Washington University School of Medicine in St. Louis, who led the study team. “We think of bacteria eating things like sugar, but not antibiotics,” he said in an interview. Understanding just how bacteria do this can help in the design of new and better antibiotics, Dantas said, and can help clean up some of the problems that help lead to antibiotic resistance in the first place, such as spills from factories that make the drugs; waste from farms where animals are fed antibiotics to make them grow; and hospital sewage. 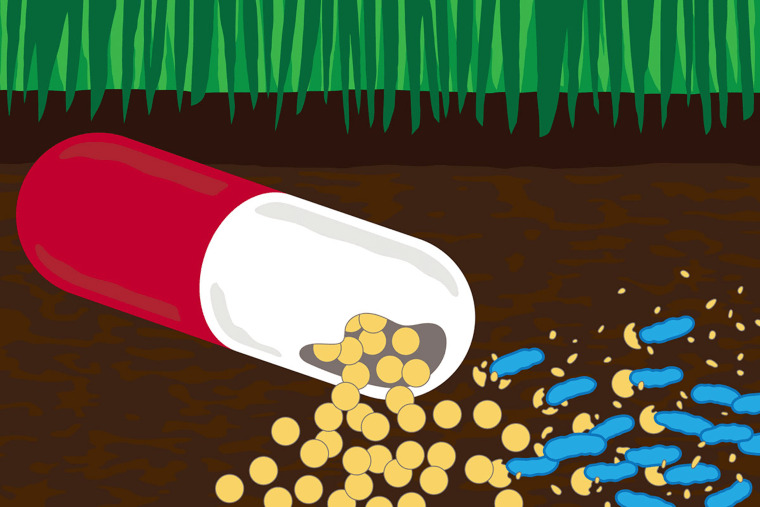 Drug-resistant superbugs are now found virtually everywhere. The Centers for Disease Control and Prevention says in the U.S. alone, more than two million people are infected by antibiotic-resistant germs each year, and 23,000 die of their infections. Globally, these microbes kill 700,000 people a year. They’ve developed as people pop antibiotics to treat colds, the flu, ear infections and various other ills caused by viruses and fungi that are not affected by the drugs. They grow in farm animals fed antibiotics not to treat disease, but to make them grow fatter and faster. They can thrive and spread in hospitals and in the community. Bacteria can develop resistance almost immediately to antibiotics — in no small part because most antibiotics already come from bacteria, which make their own to kill rival bacteria. So some bacteria already carried the genes they needed to resist antibiotics long before the drugs were ever invented. Dantas says his team was not the first to discover that some bacteria can eat antibiotics — that happened in the 1960s. But they were not considered important, because they didn’t infect people and were rare. What's so super about a superbug? “Even though not a lot has reported since then, we showed that many more antibiotics were at the buffet table for bacteria,” Dantas said. They figured out how, step-by-step, some strains of bacteria can break down and eat antibiotics. Then they made their own version of drug-munching bacteria. The bacteria they found that eat antibiotics use some of the same mechanisms as drug-resistant superbugs do, the team reported in the journal Nature Chemical Biology. “The next thing we found is there are specialized enzymes that these antibiotic-eating bacteria have that chop these compounds down into bite-sized pieces,” Dantas said. Understanding these steps can help scientists make bacteria with the same qualities, and Dantas’s team did that, making E. coli that could live in a soup of antibiotics and actually break them down to get the carbon molecules that all life on Earth needs to survive. “We applied this knowledge to design two strains of E. coli that can consume penicillin as a sole carbon source,” Dantas said. The goal wasn’t to make scary superbugs in the lab, but to take a step toward designing something that could help clean up antibiotic pollution from factories, sewage or farm waste. And understanding the mechanisms can help drug designers stay a step ahead of bacteria that constantly mutate and evolve new ways to resist the effects of antibiotics. “People can take these building blocks and stitch them together in different ways,” said Dantas, who helped found a company, Viosera, that develops new antibiotics. He said it took his team 10 years to first learn to work with the bacteria, to grow them, to sequence their genes and then experiment on them. “Now that we have figured out how to do it, we think that other people can do it,” he said. That’s what science should be about, he said. “You provide a recipe and someone else tweaks the recipe and makes it better,” added Dantas, whose team was funded by the National Institutes of Health. The good news is that the bacteria that commonly infect people haven’t acquired this drug-eating superpower — yet. “These antibiotic-eating bacteria are not disease-causing and, as far as we know, bacteria in the labs don’t eat antibiotics,” Dantas said. And it’s not likely that antibiotic-eating bacteria will evolve any time soon. None of the bacteria the team found prefer to eat antibiotics. They just did so if they had nothing else. “If you are in the human body causing an infection as a bad bug, you have lots of food sources,” Dantas said.